Sure, you have your Pebbles and your Galaxy Gears, not to mention your various Kickstarter-funded competitors that promise even more functionality. But how much work do you really intend to do from your wrist? If all you want is a fitness tracker that plays back music and can also tell the time, then Motorola's MOTOACTV smartwatch might be all you need, and today it's available from Woot for just $129.99, over half off its usual price. 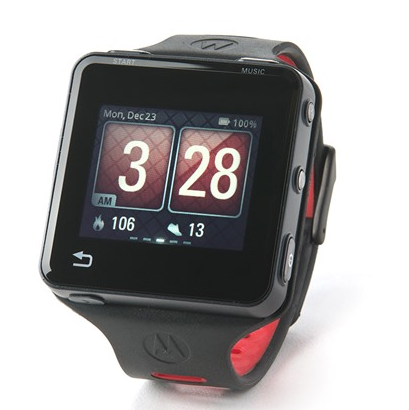 The MOTOACTV debuted back in 2011 running Android, and though it received numerous updates, it has since been discontinued. Nevertheless, its price on Amazon has yet to drop to anything remotely close to the price it's going for today on Woot. This offer is less than half the $299.99 price tag of the Galaxy Gear and $20 less than what the Pebble's currently going for. Considering this fitness watch can still sync to your smartphone to notify you of calls, texts, and calendar events, that isn't bad at all. Ouya Review Update: Has The Gaming Revolution Started Yet?